Doses for 6 persons Difficulty: Easy. Preparation time: 1 hour 20 minutes Ingredients 1 crowns of cake pastry vol-au-vent of about 28cm. in diameter with the rim no longer 'top of 5cm. 300gr. 200g of asparagus tips. cooked ham (or ham), finely chopped 100gr. 50g grated Parmesan cheese, butter, sal. FOR THE FONDUE 300gr.Fontina cheese 3 egg yolks 1 cup milk. Try to find a vol-au-vent of the measures required (usually you can order it from your pastry chef of confidence, otherwise you do it at home). Cook the asparagus in a pot of boiling salted water. In the meantime prepare the fondue: Cut the cheese into slices and place them in a pan of copper or steel with the bottom heavy. When the asparagus is cooked remove them from the pan and use the cooking water, pouring, boiling in the pot until the cheese to cover and leaving it to soak for 2 minutes. Remove water and cover the cheese with the milk. Put the pan on low heat with a wooden spoon, stir continuously until 'the cheese you will be completely dissolved and you'll have 'taken a creamy. Lift off the pan from heat and add the egg yolks one at a time, stirring constantly. Put the pan on low heat again and let the fondue thickens, stirring constantly. Warning! But should not boil to thicken, then turn off. On the oven roll out a sheet of aluminum foil and put over the vol-au-vent. Pour a ladle of melted cheese and spread it well over the entire surface, add a layer of asparagus, passed earlier in the melted butter and sprinkled with grated Parmesan cheese (I recommend, the asparagus must be on a single layer and not piled). 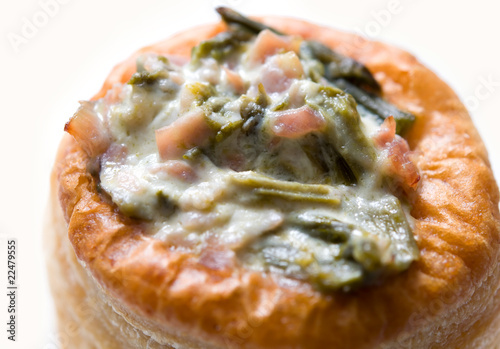 Lay the asparagus on a layer of slices of cooked or cured ham (prosciutto and calculated that the 'more' flavorful and tasty, but the vol-au-vents are cut 'with more' difficulty '). On top of the ham, pour a ladle of melted cheese and another another layer of asparagus and ham until an end with the fondue. 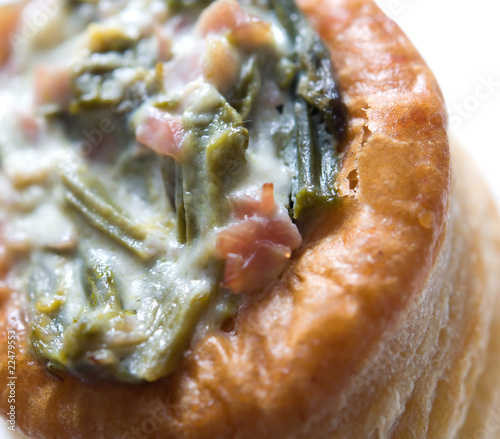 Put in the oven the vol-au-vent, after previously heated to 250 degrees for 15-20 minutes. Baked the vol-au-vent and place on a serving dish alone or on a bed of fresh salad.